This 2006 edition celebrates first 10 years of this home-made game, it has a sturdier box of previous four selfproduced Editions 2000-2005. 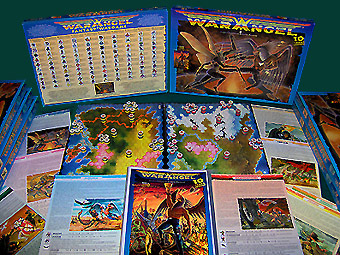 Warengel is a fantasy wargame that gave life to 100 warrior races. In the base box you have a complete game for 2 or more players. all these materials are collected in A4 plastic folders copybook to perfectly protect them.